It is possible to assign users to any work item in Targetprocess. The list of roles in Assignments can be customized. This article describes how to add an existing role as an option and how to remove a role from the Assignments Area. Let's say, we would like to add the Designer role as an option to the User Story Assignments area or remove QA Engineer from there. A Role appears in the Assignments for an entity when there is at least one state in the entity's workflow for which the chosen Role is Responsible. To configure the Roles list in Assignments you have to modify the process workflow settings for each entity type. Make sure the role you're going to add to Assignments is added to the system and has proper settings. How to configure Roles. Check which Process you will need to modify. This step is required because settings of Assignments depend on the Process your project follows. There can be multiple Processes in your system so it is extremely important to know the exact process you should choose for modification. Check Project name for your work item (for example, User Story, Bug, Request) in the Info panel. Process Workflow settings affect all projects and teams that share the Process you're going to modify. Be extremely careful when modifying existing Workflows. Removal of Role settings for a state or deletion of a state may cause massive loss of data. Done! Now we know what Process needs modifying. Make all required changes yourself or delegate them to a responsible Administrator. All changes can be performed by Administrators or Process Admins only. Open the list of available Processes. Navigate to Settings → Processes Setup link for that. In the left menu, open settings for the Process you're going to modify. Click on the Name of the Process to select it and expand its settings. Choose Entity Type in Workflows list. Choose User Story if you want to add a role to Assignments for User Stories. In the middle area of the page you see a list of all states of the workflow of your entity in this process. We need to find a state with No Responsible Role selected, edit its settings and add the required role as the Responsible Role for this state. The state cannot be final in the workflow. If there are no states with No responsible role selected at the moment you will need to add a new state to the workflow, then set required role as Responsible for this state. Press the Save button to save modified settings for the state. Press the Close button in the Process Editor. 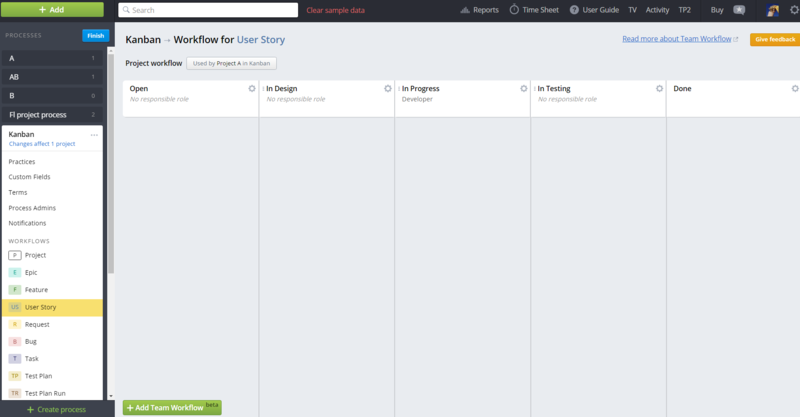 As a result, the Assignments area for User Story has been updated. Now you can assign Designers to your User Stories and estimate Effort for them. Choose Entity Type in the Workflows list. Choose User Story if you want to remove a role from Assignments for User Stories. In the list of states in the middle area of the page you will see all states of User Story Workflow in this process. A Role appears in the Assignments for an entity only when there is at least one state having the Role selected as Responsible role in the entity workflow. We need to find all states with the Role we're going to remove selected. Edit settings for each state and replace existing role with - Select Role - selection, effectively setting Responsible Role to None. Press Save button to save modified settings for the state. Press Close button in the Process Editor. In the Workflow settings of your new process, replace existing Roles with your new custom ones.